"Tough justice: lags getting longest sentences in 20 years"
It's true that the average sentence length given to offenders is rising, according to the latest figures. The average offender is sentenced to 15.5 months, compared to 14.8 months last year - though of course the portion they actually serve in prison will vary. The long-term trend also shows increases. 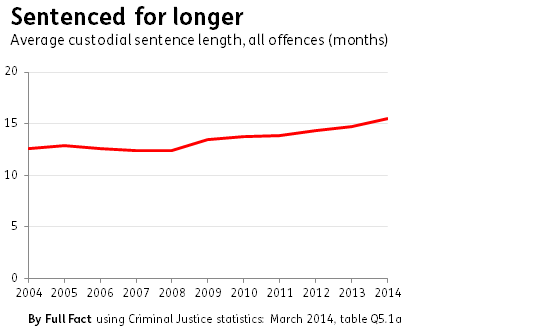 But longer average prison sentences don't on their own mean justice is getting 'tougher'. That's because the types of offence people commit varies. If people commit violent crime more often, we'd expect the average sentence length to be higher anyway: it's not necessarily a reflection of a justice system becoming more harsh. As the Ministry of Justice says, back in 2004, 75% of people were sentenced for an 'indictable' offence (i.e. among the most serious). It's now 84%; in other words, people who are being sentenced are committing more serious crimes. That's not to say government policies play no role at all, the MoJ also says laws introduced under the previous government caused sentence lengths to rise, as well as the Coalition's recent legislation in 2012. Further research is needed to measure exactly what impact they've had.